Something rather telling happened this morning, something that attests to the horseshoe theory, and indeed, what stage of the Christchurch discussion we’re now up to. Clearly, that horror is old enough for point-scoring. The important point to note is that both parties have the same motivations, and both of their situations are the same, despite the differing view. Simply put, both are seeking reinvention in the face of waning pre-election popularity. Combine this with the fact that he’s scared off foreign investment, and the writing seems very much on the wall. Simply put, Erdogan’s push to become a hardliner is obvious. It’s the old Soviet method. Evoke a century-old battle that birthed the country, and gain votes on the back of patriotic memory. In showing the clip, Turkey’s main opposition party castigated Erdogan showing “for the sake of (winning) three or five votes”, which is bang on the mark. Contrast this with Scott Morrison, and it offers a similar (if much less hyperbolic) tone. Morrison faces flagging love from the electorate to such a level that the man he turfed out, returned to point it out. 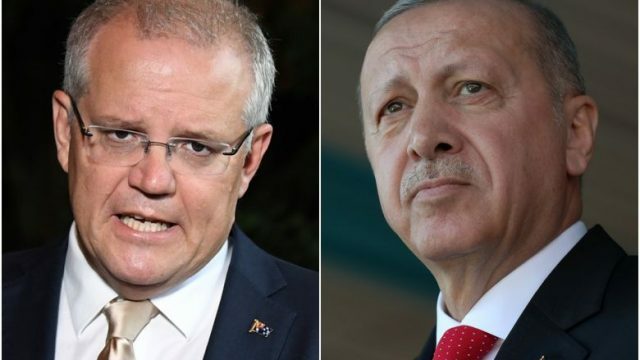 Combine this with the Coalition’s apparent failure to manage their greatest calling card, the economy, and his push to continue the fight against Johnny Turk on behalf of the ANZACs seems as obvious, as it does familiar. Whether it will have an effect on either country, time will only tell.